If you had just one word to describe Timothy Neilly it would be consistency. Despite the fact that he has not won a national tournament in over a year, Timothy has made it to at least the quarters (and mostly the semis and finals) in nearly a dozen tournaments during that period. It is keeping up that level of play that has kept him as the No. 1 player in the Boys' 14s for the past year. Timothy Neilly was born in the Bahamas and lives in Florida, where he trains at the Seminole Lake Tennis Center. The fourteen year old began winning events in 2000, starting with the Tampa Winter Challenge and ending the year with singles and doubles wins at the USTA National Open and the singles trophy at the Copper Bowl. In 2001, Timothy secured his top-ranking after winning the singles and doubles (with Marc Spicijaric) championships at the Easter Bowl. 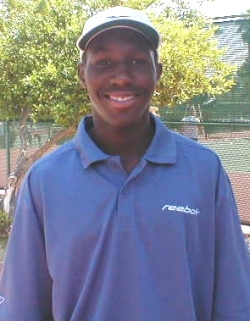 In addition to his USTA accomplishments, Timothy began to play ITF events in 2001. He was a member of the sixth placed USA team at the ITF 14 and under World Junior Tennis Championships. In 2002 he again tried the international circuit, reaching the quarterfinalists at the Costa Rican Bowl, the singles semis and doubles finals at the Eddie Herr and the doubles quarters at the Chandra Rubin International in Atlanta. Also in 2002, Timothy has moved up to the Boys' 16s division.